Ford Focus battery-electric prototypes currently are undergoing evaluation at the auto maker&#8217;s Dearborn proving ground. DEARBORN, MI – Consumers interested in electric vehicles are a “different breed,” says Dave Finnegan, Ford Motor Co. hybrid vehicles marketing manager. EV buyers are “more of a purposeful consumer in what they say about themselves and what they say about their commitment to the environment,” says Finnegan, who recently began marketing research on the wants and needs of electric-vehicle buyers. 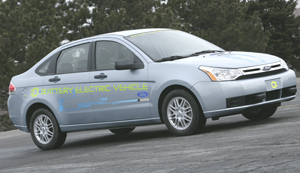 Ford is planning a 2011 production launch of the Focus Battery-Electric Vehicle (BEV). Although most early adopters of new technology tend to be younger, EV proliferation could be constrained by their inflated sticker prices. And because younger consumers often do not have the financial means to absorb significantly higher product costs, Focus BEV buyers will include people who are “not necessarily your early consumer-electronics adopters,” Finnegan says. Although initial sales likely will be on the low side, BEV volumes will grow as the public becomes more familiar with the technology, he adds, likening it to the hybrid trend. “Hybrids are still growing right now and as more and more people see and understand the technology, they see the value in it and consider moving to a hybrid vehicle,” Finnegan says. Hybrid-electric vehicles have shown steady growth in the U.S. since Honda Motor Co. Ltd. introduced its Insight HEV in 1999, selling only 17 units. In 2000, with the introduction of the Toyota Prius, the number of HEV deliveries jumped to 9,350, according to Ward’s data. The largest increase in U.S. HEV deliveries occurred in 2005, when 205,828 units were sold, outpacing prior-year’s 84,199 for a 144.5% increase. In 2008, HEV sales totaled 315,688 as the number of models offered swelled to 17. Finnegan says he is developing ways to deal with potential “range anxiety” in consumers wary of purchasing a vehicle that can travel no more than 100 miles (161 km) between charges. Although studies conducted by Ford show most motorists have an average daily commute of less than 70 miles (113 km), Finnegan says consumers must be reassured they won’t be stranded due to a depleted battery. Therefore, Ford’s marketing message will address issues such as the nation’s charging infrastructure. The Focus BEV, which will follow next year’s debut of the Ford Transit Connect BEV commercial van, should help Ford relate to environmentally conscious buyers in California, the country’s largest automotive market and one where domestic auto makers have struggled, he says. Focus BEV prototypes currently are undergoing evaluation at Ford’s Dearborn Proving Ground here, says Mark Olance, a BEV engineer involved with the program. One pending tweak is a suspension modification to handle the load difference between the Focus BEV and the conventional model. The BEV’s trunk features lithium-ion battery packs, which also occupy the space normally reserved for a gasoline tank. In addition, engineers are testing the mules to assess transaxle performance. “It’s a constant-speed transmission,” Olance says. Assisting Olance and the rest of the Ford team is a small group from Magna International Inc., the Canada-based supplier spearheading development of the Focus BEV’s powertrain. “Magna has a team in Dearborn,” he says. “They’ve just joined us in our building, so they can be a little closer to the meeting and production side of (the program).” The Focus BEV will be produced at Ford’s Michigan Assembly plant in Wayne, MI.